It's not even TOBIAS TUESDAY, and yet...it's ALLLLLL about Tobias today! Outlander: Lallybroch Episode 12 Recap: My Outlander Purgatory Breaks It Down! Lordddddd the 5 star reviews! 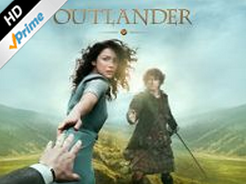 Check out what the UK is saying about OUTLANDER!!! Outlander Episode 11 The Devil's Mark: My Outlander Purgatory Breaks It DOWN! 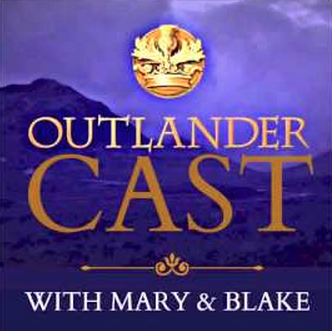 Outlander Episode 10: "By the Pricking of My Thumbs" - My Outlander Purgatory Breaks It Down! 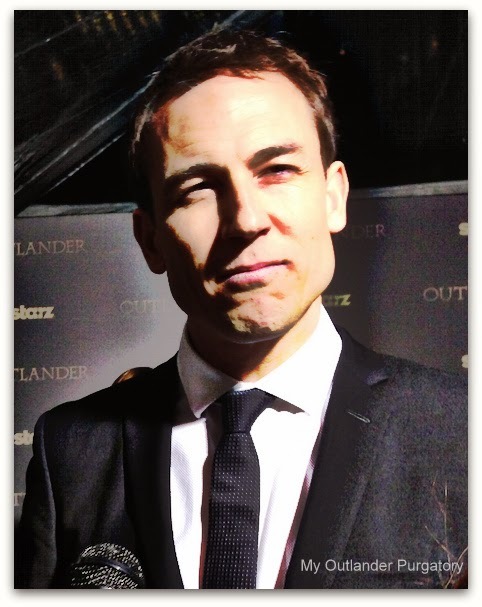 Tobias Menzies channels James Dean at the Ziegfeld Theatre on April 1, 2015. 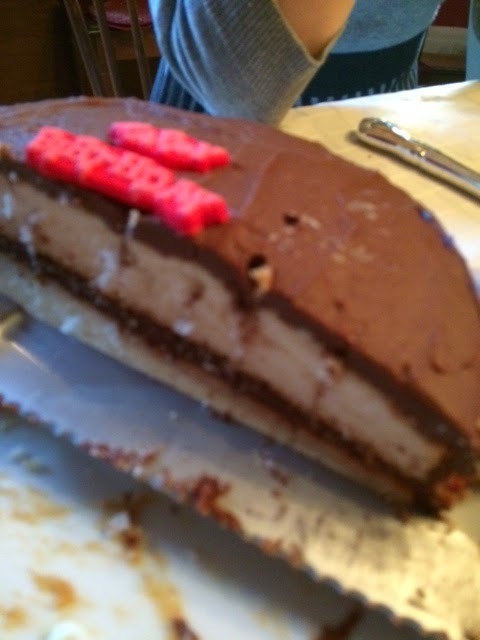 It's Tracey's birthday (happy birthdayyyyy toooo youuuuu!) so she will most likely only make it in for a few minutes toward the end. I am on vacation in Florida...but I should be able to get there with no issues (crossing fingers!) If you get there and neither of us is there, just GET THE PARTY STARTED and we'll be along shortly! 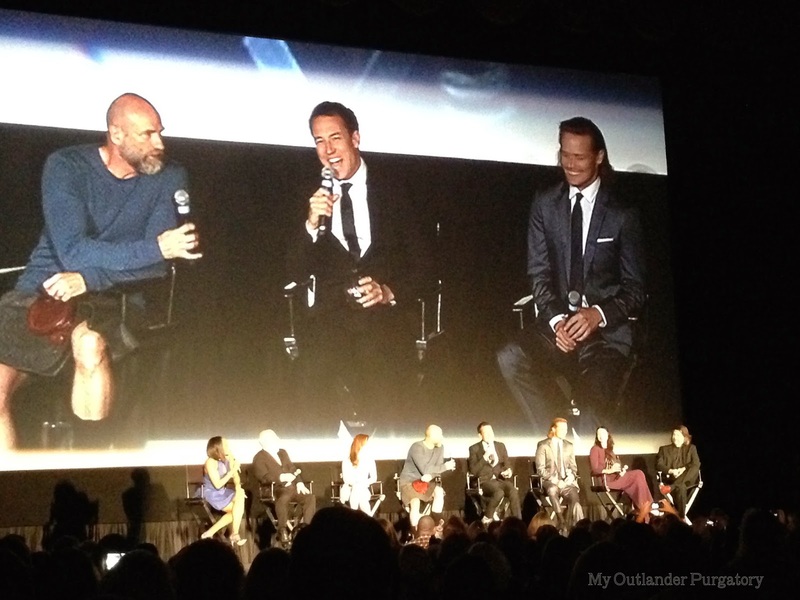 MOP Interviews the Cast of Outlander at the Ziegfeld! 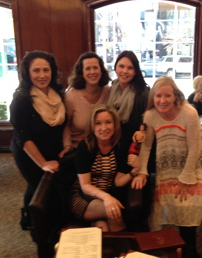 The event started out with my Outlander friends and I meeting up with Tracey, her Outlander mentor, Emily, and Third Sister Jill at Randolph's in the Warwick Hotel. We were lucky enough to snag a table near the window, so we could frontload have some refreshments, watch the festivities out the window, and giggle like 7th graders. After some much needed libations, Tracey and I headed over to the press tent, where we were treated like rock stars by the staff over at Starz. We had never done a press event like this before and felt really welcomed by everyone we dealt with. Was I right? Lotte Verbeek is a doll. And an old Hollywood-style star. I absolutely adore her. NEXT we were treated to the dynamic duo of Graham McTavish and Gary Lewis. These two were quite a hilarious tag team...and a ton of fun to meet. We discussed sibling rivalry...among other things! TELL me you wouldn't want to hang out with these two? Forget the castle, they are seriously down to earth fellows...and EXUDE Scottishness from their pores. We were in awe. 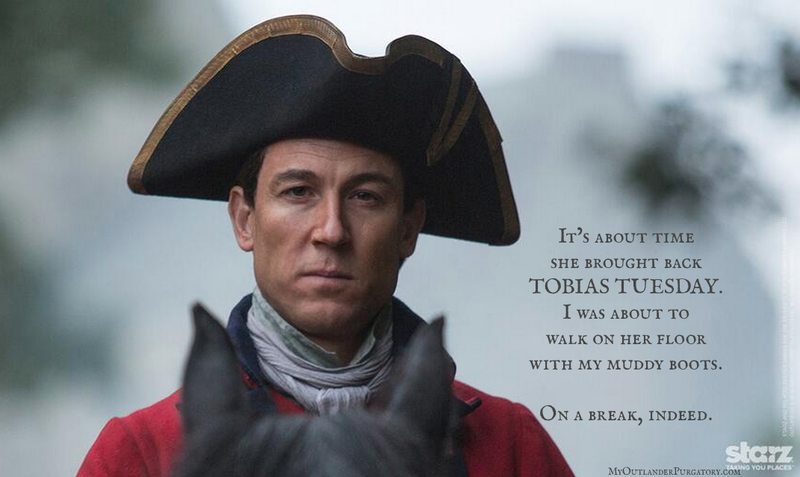 NEXT - after I saw him coming and had to regain my composure - we spoke with Tobias Menzies about how much time he spends with Sam off screen during filming, as well as the possibility of plans to bring The Fever to New York. I had to bite my tongue to stop from fangirling when Blake from OutlanderCast asked about Tobias' role as Brutus in Rome. My sincere apologies go out to Blake because I know I jumped his train when I spit out, "he was conflicted!" as he was telling Tobias how much he loathed Brutus. 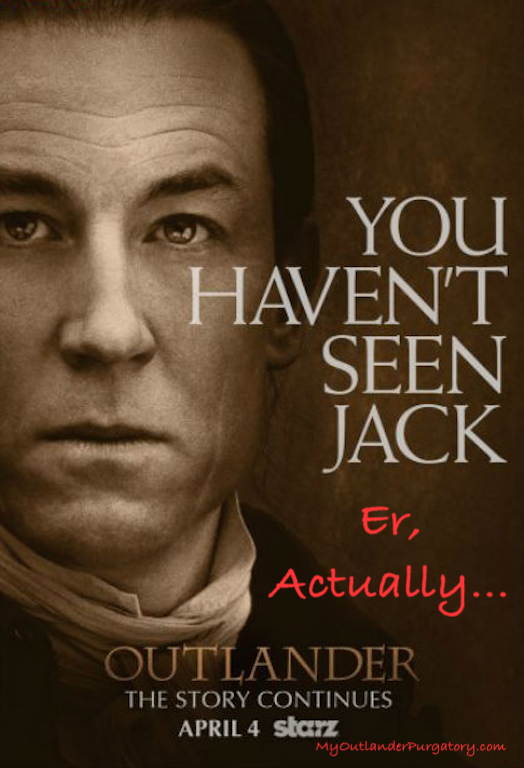 LOL I can't stand when people steal others' celeb moments, but Tobias Menzies brings out the feisty in me. NEXT we all gasped when Caitriona Balfe came along. As beautiful as she is on the show, you canna imagine how pretty she is in person. And I think it has to do with her friendly personality. She's so easy going and fun to talk to - like hanging with your BFF at the mall - and quite hilarious. We had a lot of laughs while discussing the three P's: Her version of Purgatory, Pranks on set (or lack thereof! ), and who else? Pocket Jamie! What did I tell you? The woman is positively adorable. I have never felt more comfortable around an actor. She is seriously the real deal. Soooo....after the red carpet, Tracey and I were seated in the theater while the show was already well in progress. 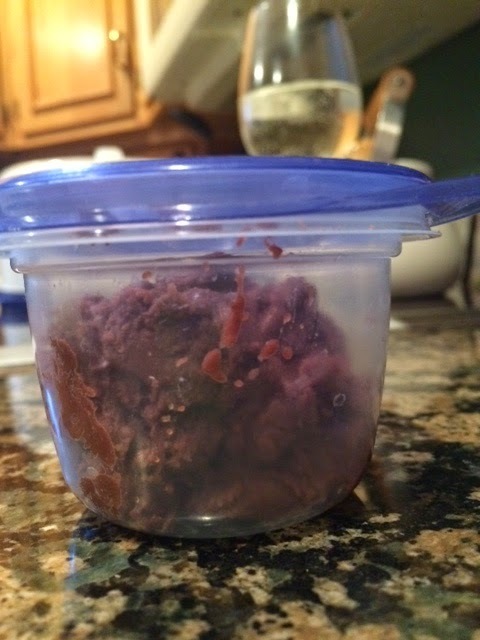 I'll give you a hint as to where it was; "You're tearing my GUTS out, Claire!" I was in stare-at-the-screen mode instantly. The episode was fantastic, as all are...and our feelings were thoroughly discussed in our recap video which you can watch here. Hope you've enjoyed our red carpet recap! And stay tuned for more interesting conversations with some other Outlander folks who gave us some pretty important info about what's to come! 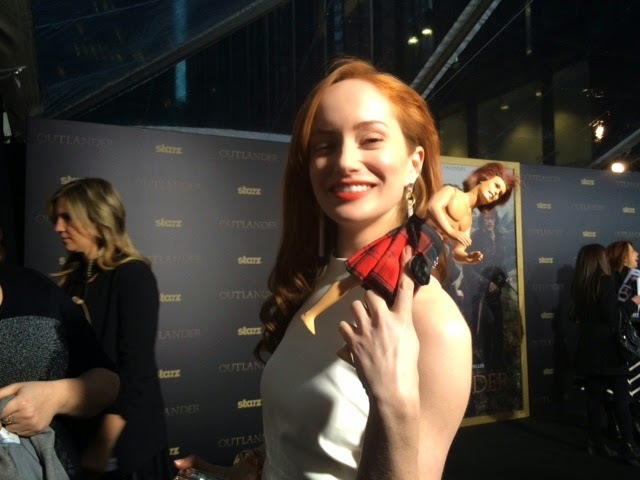 The STUNNING Lotte Verbeek asking us for a pic with The Original Pocket Jamie? 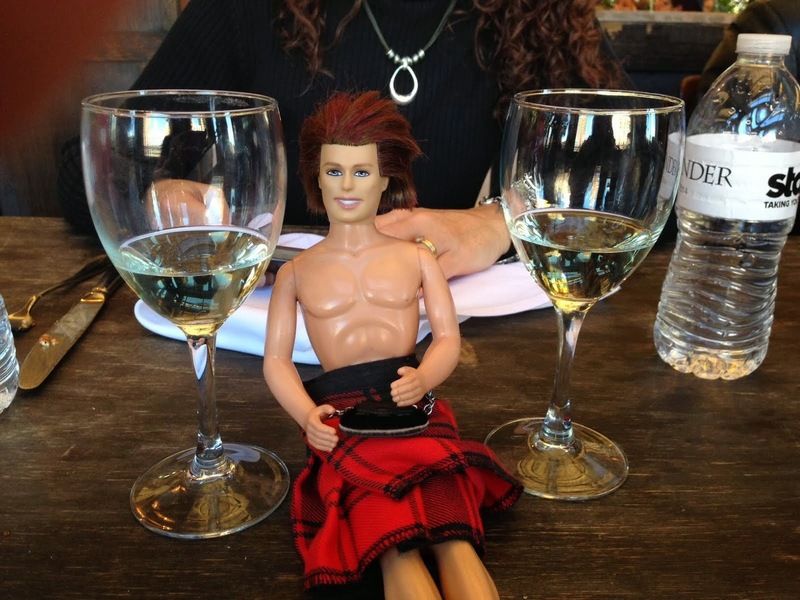 Want to get the Outlander Starz version of our Pocket Jamie for your very own? Go get him! Headed into the city in a little while...and wanted to let you all know that Tracey and I will be broadcasting LIVE via Periscope (a Twitter-owned app) tonight! 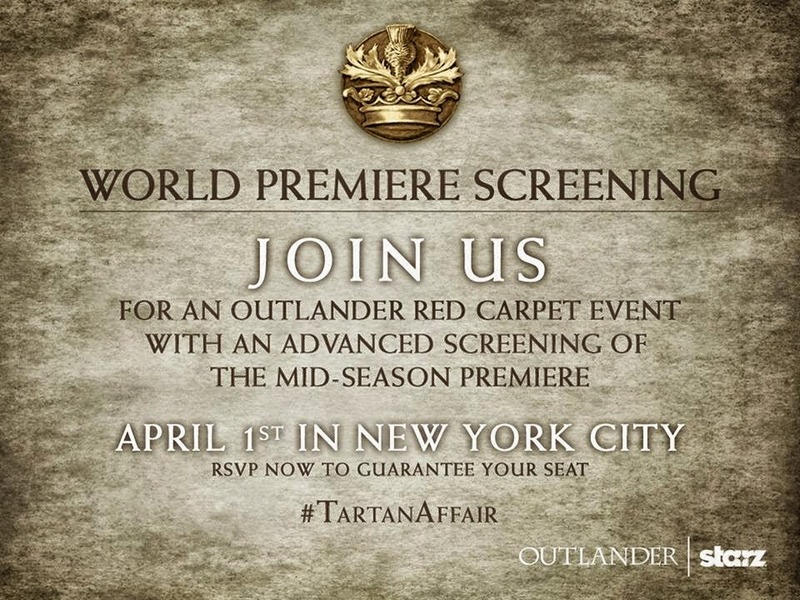 Apparently Outlander Starz is, too...so if you don't have a Twitter account, you may want to register for one, even if it's just for the evening! We tried out Periscope over the weekend and had a blast (although had no clue what we were doing!) Check out the video! Looking forward to reporting back to you guys tonight! We hope to see some of you there...and spend a few minutes with the cast! Got questions for the cast? Ask 'em in the comments!